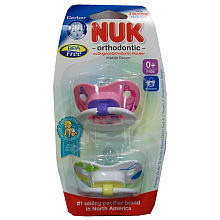 Target : 3 Packages of NUK Pacifiers for $4.58! Total = $4.58/3 or $1.53 each! I don't know about your little one, but mine loses pacifiers like crazy so this is a great deal! 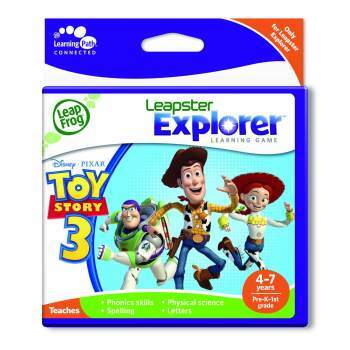 $14.99 for Leapster Explorer Games! I called my local Best Buy and they have said they would take the internet coupon BUT if you are worried that your store will not accept the printed coupon, remember you can take the Best Buy ad into Walmart and they will price match it! I am going to buy 2 and hold on to them for my Daughter's birthday! *note : the only ones on markdown are Disney Princesses and Toy Story 3 but it is still a great deal! $10.00 for an 8x8 Photo Book from Shutterfly! Today's Mamapedia deal is $10 for One 8x8 20-page Soft Cover Photo Book from Shutterfly ($20 Value). I have made several Shutterfly Photo Books and love them all. This deal is a great value! New Mamapedia members that haven't made a purchase yet can add in promo code 'MYCITYMOM3' and an additional $3 will be deducted making your photo book only $7! Plus, Mamapedia gives back by giving 5% of your purchase total to a school of your choice. Pampers Gifts to Grow - 100 Points for Signing Up! Sign up for a new Pampers Gifts to Grow account and you will receive 100 points to start! Then earn free stuff by collecting codes on Pampers products. Visit Coupons.com and look for this offer (pictured above) to receive your 100 bonus points for signing up! Today's Housewares Deals daily deal is a Farberware Professional 21 Piece Complete Kitchen Set for $25! This 21 Piece Farberware Pro Complete Kitchen Set contains all the tools most commonly reached for during food prep work. 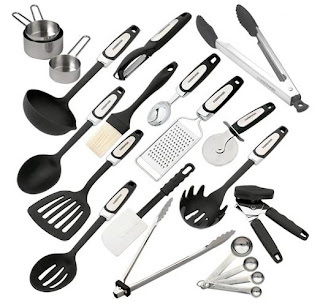 The 21 piece set includes: nylon ladle, nylon pasta server, slotted turner, basting spoon, nylon slotted spoon, ice cream scoop, Euro peeler, cheese grater, basting brush, jumbo spatula/scraper, can opener, pizza cutter, tongs with silicone tips, stainless steel locking tongs, set of 3 stainless steel measuring cups, and set of 4 stainless steel measuring spoons. Dishwasher safe, except for can opener. Dollar General does accept internet printables. Final Price the cost of the the Marshmallows. 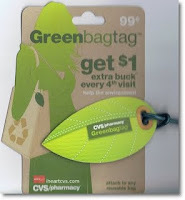 $2.00/1 Simple Green Product Coupon! Go here and fill out a brief survey and you will be able to print up to 2 - $2.00/1 Simple Green product coupons. Looking for baby savings coupons & deals? 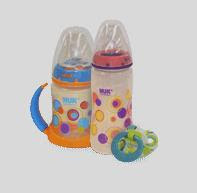 Here are some great money saving coupons from Nuk. 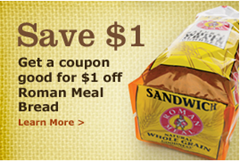 Go HERE and fill out your information to receive a $1.00/1 Roman Meal Bread coupon. By signing up, you will receive email messages featuring healthy tips, news and exclusive savings. Look for the January Coupon Book in stores!